It has been a loooonnggg time since I asked you all a question for my book! I have a question about a scene that I am fairly certain will develop at some point within my book and as I have been thinking about it for a few weeks now, I figured I should ask now before I forget about it. For those of you who don’t know (as it has been a long time), I had started writing a book about a year ago at the request of my daughter. I haven’t done very much with it in months, yet I hope to get back to it soon. Dmitri is the main male character and I believe from everything I have learned from this forum, he would have been born in Russia and left Russia as a child. So he knows Russian, has Russian memories, a nice Russian accent when speaking Russian and not the strong Russian accent when speaking English. And… thanks to all those who helped me to confirm that he CAN indeed have his gray eyes as my daughter requested! The holiday season in Russia. Particularly the Christmas, Hanukah, New Year season. Here in the States it is very commercialized and I personally abhor the entire thing. What once started out as the shopping or get in the mood spirit traditionally started AFTER our Thanksgiving Holiday (the fourth Thursday in November). This year, BEFORE Halloween there were Christmas displays up in the stores. There are already the Salvation Army bell ringers out asking for donations. So, besides the traditional movies which are watched and we have discussed… what is this season like in Russia these days? How commercial is it now? Do people in general celebrate the “season” even if it is not their faith? When does the "season" start? Are buildings and stores all decorated with lights and such? I recall hearing something last year, that people are given a number of days off from work and things pretty much shut down. This is an “odd” concept to me. How can businesses be “forced” to close for more than one day? Who pays the employees for all this time off? What if you want to buy something or need a service? I remember when I was a kid we had “Blue Laws” and many stores were closed on Sunday or had limited hours and limits on when you could buy alcoholic beverages. And they still limit when you can but a car of all things! Otherwise, most of the Blue Laws are gone. What else should I know that I have not asked? I only speak two languages, English and bad English. Click here for list of Russian films with English subtitles and links to watch them. The New Year sales start in late November. In Russia we celebrate the New Year first and then we celebrate the Christmas. Russian Christmas is on Jan, 7, not Dec, 25! And this holiday is purely religious and not commercialized unlike the New Year. To most of the people the New Year is much more important than the Christmas. There are gifts, of course, but again - they are the New Year gifts, not Christmas gifts. Russia had been living with the Julian calendar before the October Revolution of 1917 and this calender was late by 13 days. Then the reform came and we caught up with the rest of the world although the church continued its life according the Julian calender. 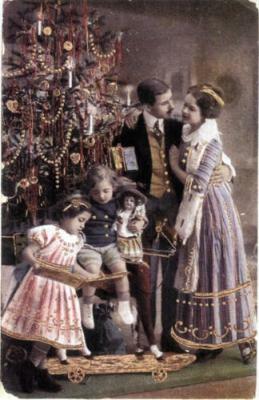 Now we have our Christmas on Jan, 7 and the New Year (Julian or Old style) is still celebrated on Jan, 14. This is called 'Old New Year'. This way we have more holidays than the rest of the world. One more Holiday season: May Day. (1—9 of May). Not all days are official holidays but people like to make a short trip "на майские (праздники)"
It approximately corresponds to Easter holidays. If the plot of your book is placed to the present time, Dmitri may be don't have memories about endless Christmas - New Year holidays. This is a recent invention. During the Soviet era we had two days off from work: January 1 and 2. Children had longer holidays though. Russians (I mean, those who are not religious) started celebrate western and Orthodox Christmases (yes, both of them) during 1990-th. The long holidays from January 1 to 10 became a common practice at the end of 90-th or beginning of 00-th and was officially approved only a couple years ago. If the plot of your book is placed to the present time, Dmitri may be don't have memories about endless Christmas - New Year holidays. Good point... I have him as no older than 23. So he would have been born in say 1984 or later? And if I understand from all the comments about accents, he would have needed to leave Russia by the time he was about 7 to 9 to be able to really speak English without a Russian accent (unless someone can prove me wrong about that one). So that would put him leaving there at 1991 to 1993. To have the story be the way I REALLY wanted it, he would have lived there until he was a teenager and have gone through some VERY intensive dialogue/speech/diction to get rid of the accent. But.... I am not certain that even this would accomplish getting rid of "your" accent and make y'all ever truly sound American. It appears once you have reached your teenaged years, it is hard to get rid of the Russian accent. And for his character, for what I am trying to accomplish, it is fine that he IS Russian and can speak Russian and has certain Russian traits that will come out in time... the accent thing while speaking English, is sort of a deal breaker. Quite commercial. The West gave us the bug. Though I don't see that as a bad thing neccessarily. It creates a special atmosphere and mood... This year I saw workers constructing a special long counter all devoted to New Year merchandise in the shopping center where I used to work as early as the beginning of November. New Year is celebrated by everyone with great style. And it looks the same as Christmas - fir-trees in living rooms, Father Frost (=Santa Klaus) bringing presents, etc. I don't really celebrate Christmas, first because I'm not religious, second, because New Year festivities come first on the 31st of December, so all principal energies are thrown into celebrating New Year and preparing the New Year meal. The people who are believers, though, do go to the church and probably make something special on January 7th. All those involved in commerce start early, by mid-November - December there are already decorations everywhere and things. Not on a very prominent scale, though. Normal people go crazy from December 25th, as Ramil said. Only some buildings are decorated on the outside and mainly in big cities. The bigger the city, the more lights and pomp, I s'pose. Where I'm from, we live mostly in apartment blocks, so there's no tradition of decorating 9 storey houses. Some sort of children's festival in the kindergarten or school -- they're called "outrennik" from the word "outro" -- morning, because, as children's festivals, they're conducted in the morning or afternoon, and not in the evening. That would be around the 25th of December but every school and organization decide for themselves -- it's just because the term ends and kids' vacations start a little earlier than January 1. The whole of 31st of December is spent cooking the dinner. Mum cooking, Dad in and out, he has to go to the shop and buy something that Mum suddenly remembered that she needs for her cooking. A fir-tree decorated with fairy lights (or what d'you call 'em? Xmas lights?) and all sort of baubles. Tangerines. Salad "Olivier" and all sorts of yummy stuff... Some musical programmes on tv and old films about snow and Father Frost that create the background for the whole evening. The president's speech. Champagne. Fireworks -- though I'm not sure there were fireworks in the Soviet Union times, most probably not. These days I have a whole spectacle right in front of my window, so if I don't go out myself, I spent some time on my balcony watching the magnificent display. The firewors go off seconds after 12 o'clock strucks. At 00:00 exactly everyone's drinking champaigne. The presents from Father Frost are found under the fir-tree on the morning of January 1. We don't have red socks hanging from the fireplace, in fact, not many people have fireplaces. Only those people have a ten day leave (1-10 January) who are "white collars", that's to say, who work in organizations which can afford such vacations - managers, teachers, accountants... Shops work. I worked in a bookshop last year so I had to go to work on the 1st of January at 3 pm -- that was the time that our shopping center opened. It couldn't have been 10 am, as usual, since it's highly unlikely anyone could possibly manage to get up that early after the most important night of the year. I don't drink alcohol, so that was no problem for me, I didn't have a hang-over. Two of our girls spent the working time drinking champaigne and got rather tipsy. Some ambulance (paramedics?) and militia workers have to work on the 31st of December and the 1st of January which are the worst days to have to work on because everyone else is celebrating. BUT, according to the law, you must have your ten days' paid leave in January, so if the organization can't provide you with holidays from the 1st to the 10th of January, you are still to have them dispersed throughout the month. I worked the whole January like that - 2 days of work, 3 days of rest, very relaxing it was. That's in theory, of course. Some organizations aren't so law-abiding and might make their employees work not only the whole of January but also 6 days a week instead of 5. I have a friend who works like that as a secretary for Kirby vacuum cleaners. She basically doesn't have any benefits provided by the law, like one-month paid leave every year, etc. I think it's outradeous. That's not what the 1917 Revolution was about!! There now. I've gone and done it again. I just can't write short posts. Alice: One can't believe impossible things. The Queen: I dare say you haven't had much practice. When I was your age, I always did it for half an hour a day. Why, sometimes I've believed as many as six impossible things before breakfast. ...There now. I've gone and done it again. I just can't write short posts. I am!!! *рвет на себе волосы* Long posts - wagons of mistakes. they're called "outrennik" from the word "outro"
Не признала в таком виде. )) Может, лучше русские слова по-русски писать, здесь все-таки изучающие язык собираются (подобие транскрипции можно рядом в скобках, раз уже так хочется)? In both words the first syllable is stressed. The mentioned morning action (or morning show) is the thing your character certainly must have. It is a fancy-dress show where kids are both the viewers and the participants. The show takes place near a decorated fir-tree. Two main adult leading characters are Ded Moroz [(Grand)Father Frost – Santa Claus] and Snegurochka. Some people believe that Snegurochka is a daughter of the Ded Moroz while others think that she is a grandchild. The show have some common rules. Firstly only one main character appears before the kids: either Ded Moroz or Snegurochka. Then the appeared character asks the kids to call the other main character. The kids call him several times aloud. Next story may vary in many ways: the non-appeared character may appear and show goes on or may be kidnapped by villains from fairy tales and the kids need to rescue him etc, etc, etc. During the show there is one more event which must take place: initially the lights on the fir-tree are off and the kids must call several times aloud "the fir-tree fire on!" and only then the lights go on. Most boys play the role of an arctic (white) hare while most girls are snowflakes. Those ones whose character is not a hare or a snowflake are superstars. 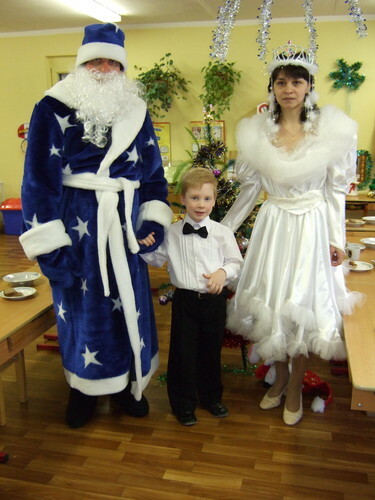 Another memorable thing for kids is the visit of Ded Moroz to their home. Ded Moroz with Snegurochka come to the kid’s home. The kid read aloud a poem or sing a song about the New Year. Then Ded Moroz take a gift out from his big red (or blue) sack. It was noted that in Russia we don’t use the socks for gifts but mainly find the gifts under the fir-tree. So for the kid it is much much better and more memorable if the gift is given by Ded Moroz directly. So for the kid it is much much better and more memorable if the gift is given by Ded Moroz directly. Do not forget about Snegurochka! Это мой мелкий в саду в позапрошлом году. Yeah, I thought about writing it 'utrennik' but then it can be read 'jutrennik'. I wrote it in English so that rockzmom might have an idea of how it's pronounced. 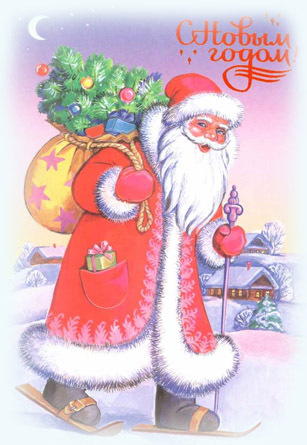 To rockzmom: You might mention your hero writing a wish-letter to Ded Moroz/Father Frost, that is, a letter asking for some special gift for this New Year. Russian Santa lives in a town called Veliky Ustyug where kids' letters are allegedly directed. I think this idea has a great dramatic potential. Provided the character doesn't ask for something mundane, like a computer. Ded Moroz brings presents to children. However, unlike the secretive ways of Santa Claus, he often brings them in person, at the celebrations of the New Year, at New Year parties for kids by the New Year Tree. The "in-person" gifts only occur at big organized celebrations, where the gifts can be "standardized." The clandestine operations of placing the gifts under the New Year tree still occur while the children are young. 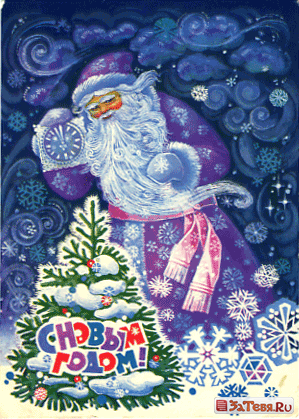 Ded Moroz is accompanied by Snegurochka (Russian: Снегурочка), or 'Snow Maiden,' his granddaughter. She is a unique attribute of the image of Father Frost – none of his foreign colleagues has a similar companion. The traditional appearance of Ded Moroz has a close resemblance to that of Santa Claus, with his coat, boots and long white beard. Specifically, Ded Moroz wears a heel-long fur coat, a semi-round fur hat, and white valenki or high boots (sapogi), silver or red with silver ornament. Unlike Santa Claus, he walks with a long magical staff, does not say "Ho, ho, ho," and drives no reindeer but a troika. The official residence of Ded Moroz in Russia is the town of Veliky Ustyug. Здравствуй елка — Новый Год! In 1916, in Imperial Russia the Holy Synod called to boycott Christmas trees as a tradition, originating from Germany (Russia's enemy during World War I). In the Russian SFSR and the Soviet Union Christmas trees were banned until 1935 because they were considered to be a "bourgeois and religious prejudice". In 1928 Ded Moroz was declared "an ally of the priest and kulak".. Nevertheless, the image of Father Frost took its final shape in the USSR: he became the main symbol of the New Year’s Holiday that replaced Christmas as the most favourite and fairy holiday in the pre-revolutionary Russia. The New Year's tree was revived in the USSR after the famous letter by Pavel Postyshev, published in Pravda on December 28, 1935, where he asked for New Year trees to be installed in schools, children's homes, Young Pioneer Palaces, children's clubs, children's theaters and cinema theaters. Postyshev believed that the origins of the holiday, which were pre-Christian in any case, were less important than the benefits it could bring to Soviet children. In 1937, Ded Moroz for the first time arrived at the Moscow Palace of Unions. In subsequent years, an invitation to the New Year Tree at the Palace of Unions became a matter of honor for Soviet children. The image of “Soviet” Father Frost was established by Soviet filmmakers in the 1930s. The color of the coat that Ded Moroz wore was changed several times. So as not to be confused with Santa Claus, it was often blue. Joseph Stalin ordered Palace of Unions' Ded Morozes to wear only blue coats. During the times of the Soviet Union's dominance over Eastern Europe, Ded Moroz was officially introduced in many national traditions, despite being alien to them. That wraps about the Yuletide night. Two soldier husbands and a war. Forebodings filled and pressed her heart. Has so designed the human heart. To murmur lies in aged ears. Some wondrous thing that she would learn. They spade up silver from a ditch! Now, I am no great shakes with Christian festivities, but as I understand it the Christian feast Крещение/Kreshenie/the Baptism falls on the 19th of January, and since this period is often the coldest in Russia it is also called Крещенские морозы/Kreshenskiye frosts. The fortune-telling is associated with the Kreshenskiye frosts. My friends and I used to mess about and dabble in divination at Sviatki, too, when we were teenagers. I don't believe in any of it but it's fun. So, basically, if there are any female characters in the book, especially young girls, that's one of the things they might do at Christmastime. All kids engage in various winter-time activities, like sledding/sledging/tobogganing, skiing, skating, snowball-fighting (that's possible only when it's warm enough for the snow to become wet and sticky, instead of powdery, so that snowballs can be formed), building the Snowman. This is what the ordinary sledge looks like. A rope is fastened to it and children can take each other for a ride in great style. Note the comfy back. You can slide on a sled/sledge down ordinary or specially constructed ice hills -- this is more fun because it's breath-takingly fast, but also quite dangerous. Bruises are almost inevitable. When sliding down an iced hill, it's better to use a simpler model of sled without steel runners. I have only just begun to read these posts and they are amazingly fantastic! Older daughter has been ill all week and now to top it off she has ugh... what we call "pink eye" or the medical term "conjunctivitis." So while we were waiting at the doctor's office I was reading some of your postings (via my little cell phone) to her and she LOVES your Father Frost & Snow Maiden and New Years celebrations much more than our Christmas season here!! And the idea of having a month off a year and the 10 days!! Oh, if only Russia was not soooo cold I think she would be ready to move there right now!!! She really believes now that you all have a VERY bad reputation and are in need of MAJOR PR! I agree! Thanks again for all your help... you are inspiring me to get back to writing again! from http://savok.name/116-starye_otkrytki.html -- lots of wonderful old cards here but it takes some time for the page to download as there are A LOT of pics. 1) took part in "khorovod" (http://en.wikipedia.org/wiki/Khorovod) singing traditional New year songs "В лесу родилась елочка", or "Сколько на елочке..", etc. 4) got a present (usually a box/bag of candies and sometimes fruits). 5) had his/her picture taken under the New Year tree in a New Year costume (even if it's just a foil crown). Usually parties in kindergardens are not grand events: just a small group of kids, their nurses and (often, but not always) parents. Ded Moros and Snegurochka are impersonated by the staff, parents or invited artists. Depending on the size of the organisation, which arranges a party for kids, and its wealth, it may be something small and simple or huge and professionally made. Hey, rockzmom, you can watch a few "utrenik"s videos if you are curious. Dmitry whould "remember" something like that. I chose a few to start with (there are loads of them on Youtube, but they are very much alike). 1) First to get in the mood is a DANCE OF LITTLE SNOWMEN. The little guy to the left is hilarious. And I like the way grownups giggle at the background. 2) Here is a fairly typical 'utrenik" with almost all the elemets present. Can be interesting because of some pre- and post utrenik footage from 1:30, then an episode when children traditionally shout "1,2,3, lit up, fir-tree! "at 6:55. As it usually happens the lights don't go on the first time.. New Year suspense. At the end you can see the distribution of candies. 3) Oh.. I've just found two more video from the same kindergarden. They are rather good. On the pros - LOTS of interaction with Ded Moroz, Snegurochka and fairy tales characters. On the cons - they are long (10 minutes), and the are not very conventional costume-wise (for some reason a lot of the girls are Red Riding Hoods. Weird). The kids in these are older, so the performance is a little better. Ded Moroz appears around 3:20, and he sings well. Also at 5:00 there's a traditional khorovod + the most famous New Year song. No need to watch all of it, I added it just because of a nice bit of the action: at 3:47 kids shout to prevent bad Wolf from stealing the presents, and then 'punish' him in a mock snowball fight. 1. Wrapping around "Common walnuts" with a thin metallic shining foil (in Russia we call this nut as "Greek nut"). This is the most easiest decoration for a fir-tree which any small kid can do with his hands. 2. Paper snowflakes. Everyone did it form a paper sheet using scissors and decorated windows and/or walls. gRomoZeka, that first video "DANCE OF LITTLE SNOWMEN" was soooooo cute!!! Oh my. Was there a reason that one child was dressed differently? Also the photo you posted, was that one just of the net or of someone you know or of you maybe??? Coffeecup, I posted on another thread that we are right in the middle of a blizzard! Your snowflakes look like a great way for us to pass the time! I have never seen actual patterns on how to make them! Very cool! By begemot in forum Translate This!